What are the critical elements to running a successful veterinary practice? Obviously great patient care, a great customer experience, and profitability. But what about speed and efficiency? While they may not contribute directly to the quality of patient care, they do contribute to both profitability and a great customer experience. Saving time each day means that more work can be accomplished, and efficiently moving customers through the practice creates a more positive experience. Busy veterinary practices have a lot going on. Every day. 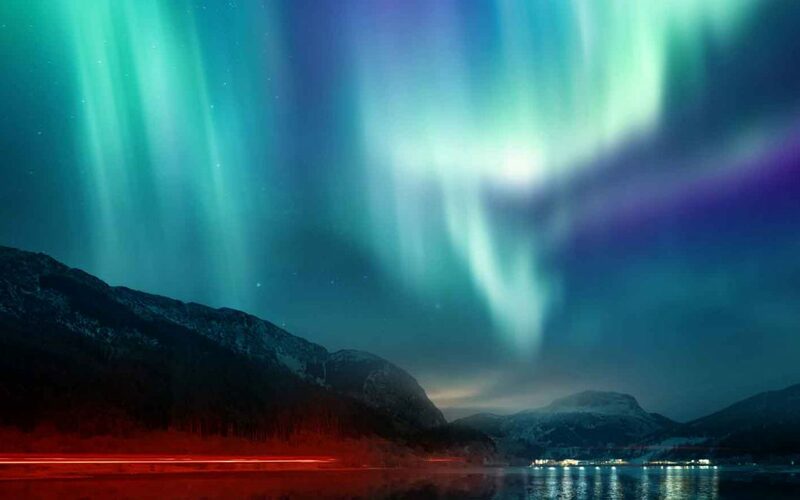 We believe practice management software should speed things up, not slow things down. That’s why we built NaVetor with speed and efficiency in mind, based on the most natural, intuitive workflows in a veterinary practice. Here are five examples of things you can do faster in NaVetor compared with other veterinary software programs. Complete the electronic medical record during appointments. NaVetor’s templates are really helpful during patient visits, but they also speed up reporting. One major limitation of most veterinary software programs is that clinical data is entered into medical records inconsistently, making it difficult to run reports on frequency of common conditions, prescriptions, and other health-related metrics. 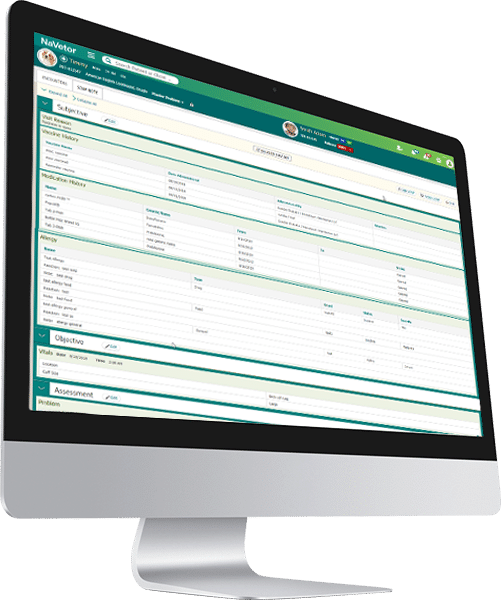 NaVetor’s templates ensure that clinical data is entered consistently, so data across the practice can be pulled and evaluated quickly and easily, from the quantity of medications prescribed during a given period to overall profitability reports. Data for all reports can be exported to Excel for further analysis. Find a client or patient. Ever need to look up a client or patient in a pinch? NaVetor’s search capabilities make that quick and easy. 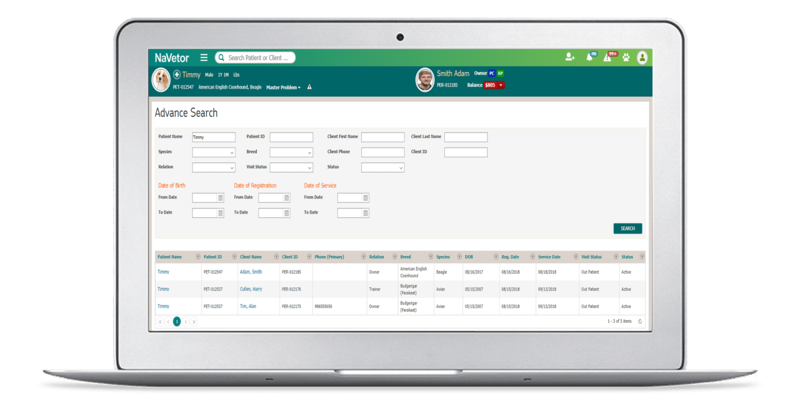 The search bar is located at the top, as part of the header, so you’ll have access to it on each screen within the software, whether you’re in the medical record, appointment scheduler, whiteboard, etc. And once you search by owner or patient, all associated owners will appear. That helps you find what you need … fast … even in situations where patients have multiple owners tied to their file. Reschedule appointments in a pinch. When a provider calls in sick, it usually wreaks havoc on the schedule for the day. Clients need to be rescheduled and tasks need to be re-assigned. 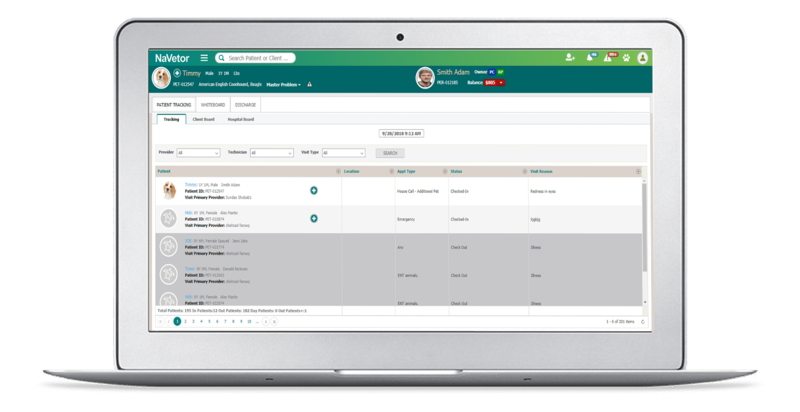 NaVetor helps mitigate some of this chaos through the Affected Appointments feature. If a provider can’t make it in that day, staff members can easily block off the day for that provider and then click “Affected Appointments.” All clients who were scheduled during that time block will pop up on one handy screen, so staff members can quickly call down the list and reschedule each client. Many software platforms today have some sort of patient tracking tool, allowing staff members to see at-a-glance status, location, and appointment details of all checked-in patients. That’s a great time-saver and efficiency-booster for practice staff, but NaVetor’s tracking tool, called a whiteboard, goes one step further. NaVetor’s whiteboard contains a client-friendly view that can be projected into your waiting room, so clients can also see the status of their pets. That not only gives a boost to the client experience, but it also saves time for staff because they don’t have to field questions from clients about the status of patients.